CES has taken over all our lives. 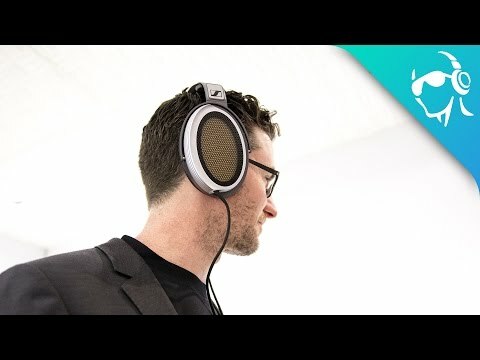 There’s tons of interesting gadgets around, but what about audio products? Last year was a pretty big year for audio and 2017 promises to be just as (if not more) exciting. We’re going to be bringing you some of the coolest audio gear we find each day, starting with these picks that jumped out at us today. The Sennheiser HE 1 Orpheus headphones were announced last year so this might be cheating, but they’re also the best headphones in the world. Unfortunately they cost $55,000 so it’s just slightly out of my price range in terms of getting them for review. But thankfully we did get a chance to check them out today and I haven’t been able to think of anything else since. The tubes give off a warm glow and removing the headphones from the case right next to it was an experience on its own. The amplifier sits on top of solid marble which is pretty beautiful by itself, but then you’re then handed a surprisingly heavy remote for controlling the volume, and then the headphones themselves. The HE-1’s are electrostatic, so they produce sound using the same electrical force that you get you rub a balloon to your hair. These can produce sound ranging from 8Hz to 100kHz and though your mind tells you that you can only hear a small part of that range, your ears swear they hear it all. Another pair of headphones we saw today that stood out came from another well-known audio company: Blue Microphone. As you may have guessed by their name, they’re mostly known for their high quality mics, but they recently began making headphones and now they’re going wireless with the Satellite’s. These are wireless, have active noise cancelling, and have a sleek retro design. They have Bluetooth 4.2 and 45mm drivers to produce sound, but what makes these interesting is that they also have a second set of drivers in the ear cups purely for noise cancelling. Blue says this is so you don’t lose any quality in the ANC process, and I have to say it worked pretty well considering where I was standing. Unfortunately, no word on pricing but you can expect these around Spring of 2017.